Parental stress may negatively affect their children’s health through a previously unknown genetic mechanism, a team of RIKEN scientists has shown. The physiological effects of stress on male mice promotes chromosomal shortening, normally associated with early aging, in their offspring. Up until relatively recently, the genes children received from their parents were considered to be passed on unchanged to their offspring. But there has been much interest of late in ways in which environmental factors can modify DNA and how these modifications can be passed onto the next generation. One such modification involves telomeres—long stretches of repetitive DNA that cap the ends of the chromosomes and insulate our genes from damage. They shorten over the course of our lives, and this is thought to contribute to the biological process of aging, although external factors also promote premature telomere shortening. “A series of studies has demonstrated that various environmental factors, including dietary conditions and psychological stress, shorten telomere length,” explains Shunsuke Ishii at the RIKEN Cluster for Pioneering Research. 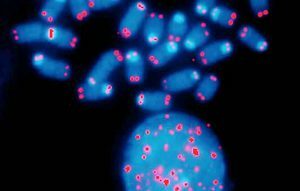 Previous studies have found evidence that children whose parents have experienced high stress levels may inherit shorter telomeres and consequently poorer health. But there has been no clear demonstration of cause and effect. Now, by looking at how the effects of stress in adult mice affect the telomere integrity of their children, Ishii and his team have found a mechanism by which stress shortens telomeres in offspring. The researchers had previously shown that injecting mice with a protein called tumor necrosis factor – a (TNF-a) — a pro-inflammatory signal produced by the body during psychological stress—triggered telomere shortening. “Thus, in this study, we tested whether injecting TNF-a into father mice can induce telomere shortening in their offspring,” Ishii says. 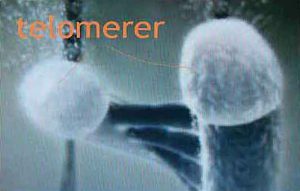 Following TNF-a injection, the germ cells that give rise to sperm produced elevated levels of telomere repeat-containing RNA (TERRA). These RNA transcripts selectively inhibit telomere maintenance and can thereby contribute to the shortening of these chromosomal structures. Importantly, the sperm produced by these mice retained the excess TERRA, and male offspring resulting from fertilization with these sperm exhibited significantly shorter telomeres. Ishii believes this finding is an important step toward demonstrating that parental stress can potentially have a causal effect on a child’s long-term health. “The main reason why the heritable effect of stress hasn’t been widely accepted was that its mechanism was unknown,” he notes. It should be straightforward to measure TERRA levels in human sperm, and Ishii now intends to conduct more tests of the extent to which different stressors trigger this effect.